Daniel Neale, animal welfare director at Animals Asia, has penned an open letter to authorities in a northern Vietnamese city to call for the abolishment of buffalo fights held yearly in one of its districts as part of a long-standing tradition. The decades-old Do Son Buffalo Fighting Festival is an annual spectacle, held on the ninth day of the eighth month in the lunar calendar, where thousands of locals in Hai Phong City’s Do Son District gather around a giant ring to cheer water buffalo as they are made to fight one another until a single contender is crowned the year’s champion. In his letter addressed to Hai Phong chairman Nguyen Van Tung, Neale expressed his concerns over the welfare of buffalo pitched against each other during the festival, as well as the community’s safety at the event. In July, a man was gored to death by his own buffalo that he had brought to the 28th edition of the festival. During the 2007 festival, a 73-year-old referee was seriously injured from a slam by one of the participating buffalo, Neale recounted in his letter. In his letter, Neale cited how fighter buffalo are fed bagasse, beer, vitamin supplements, bear bile, ginseng and python fat to increase their aggressiveness and stamina for the festival. The animals are also trained in harsh conditions for long periods of time prior to the event without regard for their suffering, he added. 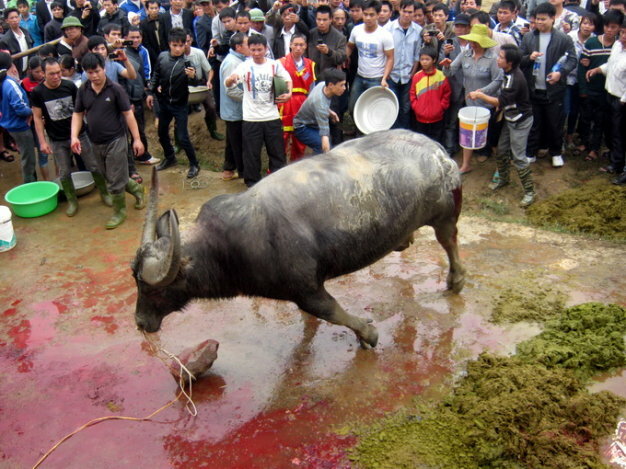 According to the animal rights activist, all aspects of the festival, from the method of training the buffalo to fight to the way they are slaughtered for meat after the event, are no longer compatible with Vietnam’s vision of developing a civilized and modern culture. This vision, he wrote, seeks to promote humanity and good traditional cultural values, while eliminating evil and outdated customs. Neale called for the administration of Hai Phong to work with Animals Asia to put an end to the festival out of concern for the safety of the community and respect for the law. In related news, Animals Asia on Saturday held a debate in Hanoi on maintaining ceremonial sacrifices in festivals as a way of conserving traditions. Most youths and animal welfare workers who attended the event agreed that fests involving the abuse of animals should be terminated to fit with the development of a modern and civilized society.